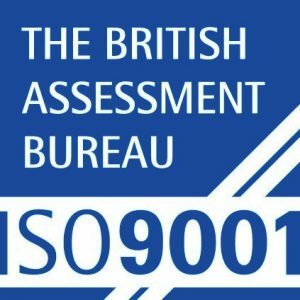 Inductosense, in partnership with EDF Energy, conducted a 6-month trial to demonstrate that the Inductosense WAND sensors could be used to accurately monitor tidal corrosion, and potentially replace traditional corrosion coupons. 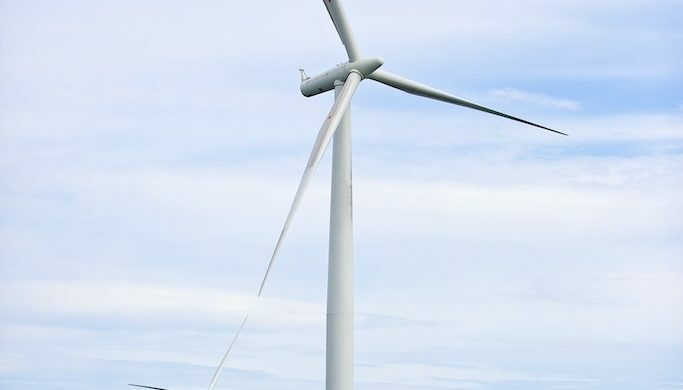 Tidal corrosion on the inside of wind turbine monopiles is a major risk for offshore wind turbine foundations, and can lead to expensive retrofitting, downtime and safety issues. It is therefore necessary to monitor the rate of corrosion. The current method requires corrosion coupons to be placed inside the monopile in the tidal zone. The corrosion coupons need to then be taken back to a lab, have the corrosion products removed and be weighed. From the loss in weight of the coupon the corrosion rate can be calculated. The process takes time, is expensive, prone to errors and the coupons can only be used once requiring numerous coupons to build up an accurate picture of the corrosion rate at a point inside the monopile. The solution proposed by Inductosense, in addition to making the process more reliable, streamlined and leading to the generation of many more data points, would allow cost savings by integrating the sensor signal acquisition in routine maintenance and removing the need for costly lab time. The Inductosense ultrasonic WAND sensorsprovide accurate monitoring of wall-thickness and enable trending of corrosion rates. The sensors are permanently installed, battery-free and wireless. They are activated when the WAND Data Collection Probe is brought close to the sensor. For this application the WAND sensors were permanently installed on certified corrosion coupons and protected with a rubber coating. The sensors measure the wall thickness of the exposed face as it corrodes. 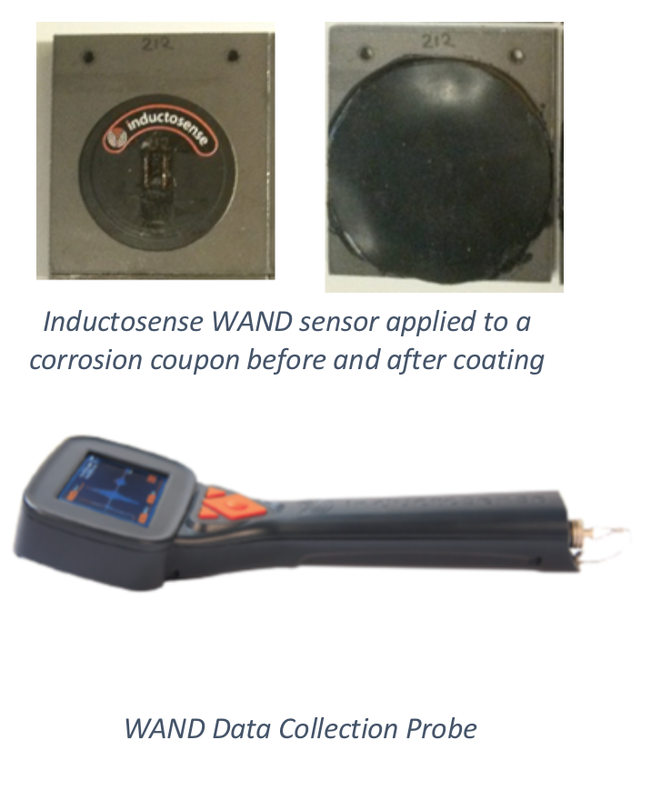 Using the WAND Data Collection Probe fast in situ corrosion measurements from the same coupon over periods of time without human error can be obtained. There is no need to remove the coupons from the site and ship them for lab analysis as with traditional coupons. The corrosion coupons with installed WAND sensors were placed in a corrosion rig at the EDF laboratories of Les Renardières alongside standard corrosion coupons as control samples. The rig was designed to simulate the effects of tidal corrosion in wind turbine monopiles, by filling up and emptying the crate containing the coupons with mains water alternately. Measurements from the WAND sensors were taken frequently by lifting the coupons out of the water and acquiring the signal wirelessly with the probe. The coupons were then put back into the bath without disturbing the corrosion product. The standard corrosion coupons were removed in two batches after 3 and 6 months in the tidal bath. These coupons provided a one-time measurement of the wall thickness measurement through the traditional laboratory process of cleaning corrosion products and weighing. The results show agreement between the standard coupons and the coupons with the WAND sensors installed after 6 months. There is a discrepancy in the measurements at 100 days with the standard corrosion coupons showing more wall loss. This can be attributed to the edges of the coupon which corrode quicker than the surface area initially and which is not so representative of the internal surface of the monopile. The WAND sensors with the protective rubber coating can withstand tidal conditions and can monitor the rate of corrosion due to tidal conditions. This solution also offers the potential for more accurate data and a reduction in time and cost associated with monitoring internal corrosion on monopiles. The project is now progressing to an offshore deployment.